Picture of whats left of camp. Yesterday, our first crew left Davis-Ward. Hunting season has officially ended. Elena, John, Hosie, and Ringo all said their goodbyes and boarded the plane back to McMurdo. I am sure by now, they are all showered and clean and have their laundry done. What a wonderful thing (that I surely took advantage of before I came into the field)! Brian, Jim, Paul, and myself are still out here holding down the fort. 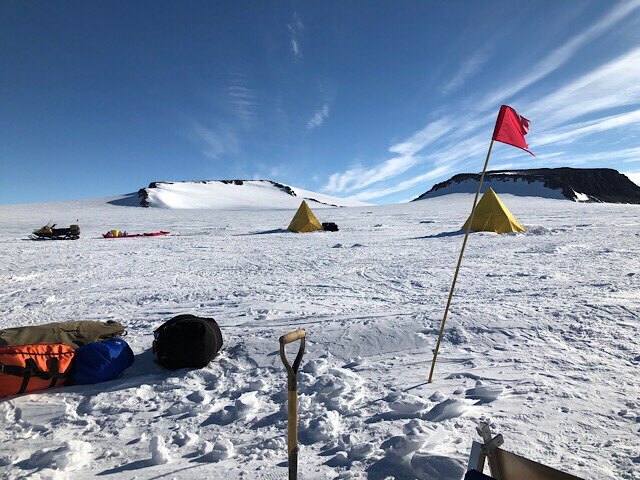 Today was an “all cargo” flight day meaning that Kaizer, Michelle, and Moose (our really wonderful Bassler flight crew) took back 5 skidoos and a ton (not literally) of other boxes back to Station but no people. We’re ok with that though. Today has turned out to be one of the most beautiful days of the season. It’s 26F outside, which is actually really warm compared to the -9F we woke up to a few days ago, and with no wind. The sun is shining and it actually feels like a nice spring day back home. I know it might sound weird, but I am thankful to have one more day out here in Davis-Ward, and a perfect day at that! P.S. Just because half of the team already made it to McMurdo doesn’t mean they’re on their way home yet. Sorry if that got all the friends and family too excited. There are still things to do back on Station – like the dishes! And apparently flights out North are booked up because it’s been too warm for the runway. PSS from Ralph- I also received formal notice this morning that Science Cargo has locked up this year’s samples in their freezer in preparation for shipping home next month.